This article is part of our special report Access to Energy. Until the governments in the countries address energy poverty which touches large parts of the population, the region will face the threat of massive deforestation, experts told EURACTIV. The hard-scrabble landscapes in Greece and Turkey, where a similar process of deforestation from illegal timbering took place decades ago, should make politicians in Bulgaria and the Western Balkan countries think about their enormous responsibility to preserve the forests, says Georgi Stefanov, climate and energy officer at WWF Bulgaria. Indeed, the use of wood for heating is becoming more widespread throughout the Western Balkans. The countries suffered from the hardships of transition from a centralised economy to the free market, and in the case of the Western Balkans – of the successive wars that helped cause the collapse of Yugoslavia. And as power prices soared and salaries stagnated in the past years, the use of wood for heating has increasingly become an alternative to electricity, not only in rural areas, but also in cities. According to some experts, district heating systems inherited from the communist era were "not the solution" for heating households in the region. Although UN statistics suggest that forested area in Bulgaria has grown since 1990, some surveys show that consumption is much higher than reflected in official statistics. Illegal harvesting also takes place, in some cases the business being called “timber mafia”. In Serbia, some analysis estimate that typical firewood consumption over the last several years has reached 12 million cubic meters in winter; while official statistics report only about 2 million cubic meters. Firewood consumption in Kosovo is estimated at more than 2 million cubic meters – more than five times higher than official statistics. Similar situations are found in Albania, Bosnia and Herzegovina, Macedonia and Montenegro. The difference between estimates and official statistics is less dramatic in Croatia. “The positive side of the picture is that Bulgaria, Romania, Serbia, Macedonia and other Balkan countries still have a lot of forests,” said Stefanov. He said that he had impressions both from his country Bulgaria and from Serbia, as his parents were living at the border and he realised that the local authorities on both sides were confronted with exactly the same problems. He also pointed out that unlike in the more prosperous Western countries, where firewood is used by wealthier people, in Southeastern Europe this resource is predominantly used by the poorest, who burn it in stoves with very low energy efficiency. In Bulgaria, these stoves made of tin are called “Gypsy love,” because they heat up rapidly and cool down even more quickly. In some impoverished areas, such as the Eastern Rhodope Mountains, near the city of Momchilgrad, most of the population contributes to deforestation, simply because residents lack income. In those cases energy poverty means ecological disaster, Stefanov said. “Entire hills are being completely deforested in just one or two seasons”, he said, adding that the situation was similar regarding all areas with compact Roma population across the country. He said that the problem was aggravated by the lack of interest of local authorities and politicians to tackle the problem, but also of the media, who in his words ignore the issue. Burning wood also contributes to the country's poor air quality. Bulgaria as well as Romania trail only Armenia in having the world’s second highest mortality rates from urban air pollution, according to the United Nations Development Programme (UNDP). The UNDP’s 2011 Human Development Report shows that while the annual death rate from poor air quality is slightly higher in Romania (439 deaths per million people compared to 437 in Bulgaria), Bulgaria leads Europe in the intensity of air pollution, ranking in the top one-quarter of the most polluted of the 187 countries included in the report. Only Armenia has a higher annual mortality rate than the two EU countries – 882 per million population in a country of 3 million people. Stefanov said that the Bulgarian government had tried to cheat on the EU, with the aim of attaining its renewable energy mix target, by reporting that two-thirds of the population was using biomass for heating, burning it in stoves with efficiency higher than 75%. In fact, the same proportion of the population is using firewood in stoves with extremely low efficiency. Fortunately, Brussels did not accept the argumentation, Stefanov said. “If the government had pursued a policy of introducing more effective heating devices, such a policy would have brought results,” he said. The only energy assistance the poor are receiving for the winter is low-quality coal or wood, Stefanov said. For two years now, WWF has been trying to pass the message that this assistance, for which about a sixth of the population qualifies, should be transformed into promotion of energy efficiency through social assistance schemes with the participation of large energy companies. The Southeastern Europe region is dependent on imported energy, primarily oil and natural gas, according to a recent report by the Energy Community, a regional body intended to integrate Southeast European countries into the EU's internal energy market. Several of the countries are also heavily dependent on imported electricity, the report said. In addition, the erratic electricity consumption pattern of poorer parts of the population was singled out as a key reason for concern. 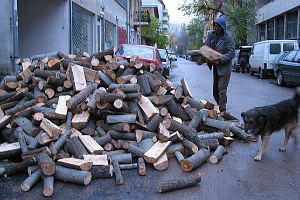 Erratic consumption is driven by the fact that firewood is used by the poor for heating, but during the cold season electric heaters are often used when firewood demand spikes. This exacerbates seasonal and weather-related peaks in electricity demand. Extreme peaks can then cause blackouts or require rationing, the report says. Dnevnik, the EURACTIV partner in Bulgaria: ??? : ???????? ? ???????? ?? ????????? ??????? ?????? ????????? ????????? Novinar, Bulgaria: ???????? : ????????? ? ????????? ????? ? ???? - ?? 5 ??????? 3 ??????? ? 2 ?????? bTV, Bulgaria: ????????? ????? ????????? ???.-??????? ?, ?? ?????? ??? ?